We had a double baptism this week. Yes, it breaks a liturgical rule about lent, but the text was perfect – living water, John 4:5-26. The entire segment of John from Nicodemus through the Samaritan Woman and the well with a picture of actual baptisms(!) in between is full of baptismal images and recognition stories. Many of my metaphors or ways of thinking come out of the business world. One of the clearest to me is a business/tax term called a safe harbor. Many tax laws create safe harbors where if you do your accounting in this way – you are safe. Lets just say those safe harbors are usually the common sense way you would recognize revenue or cost. Many businesses operate outside of those safe harbors. They are not necessarily breaking the law, but if the IRS pursues them and wins in tax court, the business will owe taxes and penalties. They were not operating in a safe harbor. Businesses do this because: a) they might not get caught, b) their accountants and lawyers say it is within the law as written, c) it allows them to keep and report more income usually and sometimes more cash flow when they don’t have to send money to uncle same, d) it might make sense for their industry and laws move slower than business. The sacraments are how God wants to deal with us. They are the only sure way that God has given for his grace. Baptism is objectively when the Father puts his Spirit in us and claims us as His children. But we all have our subjective stories to tell. We might practice faith outside of those safe harbors – however risky that might be. Nicodemus and the Samaritan woman are paired stories about recognition of God and how he works. Nick comes in the dark, and leaves in the dark. He doesn’t recognize the birth of water and the spirit. The Samaritan woman comes at noon. At the start she is as far apart from Jesus as, well, as a Jew and a Samaritan. By the end she has embraced the jewish term messiah and hesitatingly applied it to Jesus. She has started to see her subjective story in the light of God’s objective story revealed by Jesus. 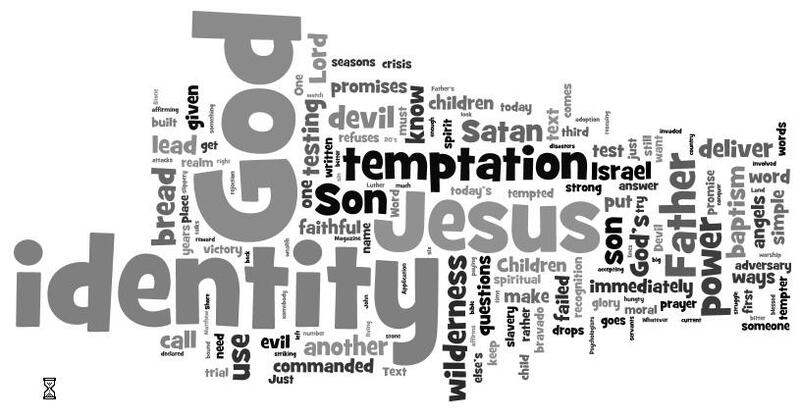 This sermon ponders the multitude of layers between our subjective experience of God and how God has revealed himself. The text itself, playfully, in a Romantic Comedy banter, deals with the Bridegroom meeting the Bride at the well. That is a stock OT image. That is what is going on at that Samaritan well. That is what is going on in baptism. If we have been given eyes to see. If you are an engineering student you’ve heard the joke that goes with that question. I like that joke. I think that joke captures a whole bunch of folk wisdom beyond just being funny. I probably should just post this and not say much. But I’m dumb that way. To me, what the Rob Bell Hellgate speaks to is probably less about Hell and more about how we internalize faith, or make faith our own. It is one thing to say scripture alone, but as soon as you say that, you start to realize that the scriptures are not a logical systematic textbook. They are a narrative written over millenia in different cultures and languages. And that narrative is messy. Almost every group of Christians has developed a second book to help in that interpretation. The Book of Concord is the Lutheran one. Lutherans like to use Latin. We call scripture the norma normans which means the norming norm, and the Book of Concord the norma normata which means the normed norm. Irenaeus would talk of the regula fidei (more latin) which means rule of faith. The scriptures were read with the rule of faith which we today call the Nicene Creed. A Reformed Christian would read the bible with the Westminster Catechism. A Roman Catholic Christian reads the Bible with the Papal encyclicals and canon law. I like to think of those books as guideposts. They are watersheds of wisdom that capture what a large group of Christians at a given time heard in the Biblical story. It can be real dangerous to faith to go outside of them. In the case of the Creed I’d go farther. (But even there there are two splits – the Coptic/Syrian church doesn’t accept it, the Greek church doesn’t accept the procession of the Spirit from the Son, and then there is the western church in all its forms.) Ultimately these are normed norms. Occasionally you need to test them. Occasionally the church needs to remind itself that we follow the living Christ and not a new law in whatever its form. God is his own interpreter as the Hymnwriter Cowper would put it. What Rob Bell is doing is questioning some of the planks of those secondary books. 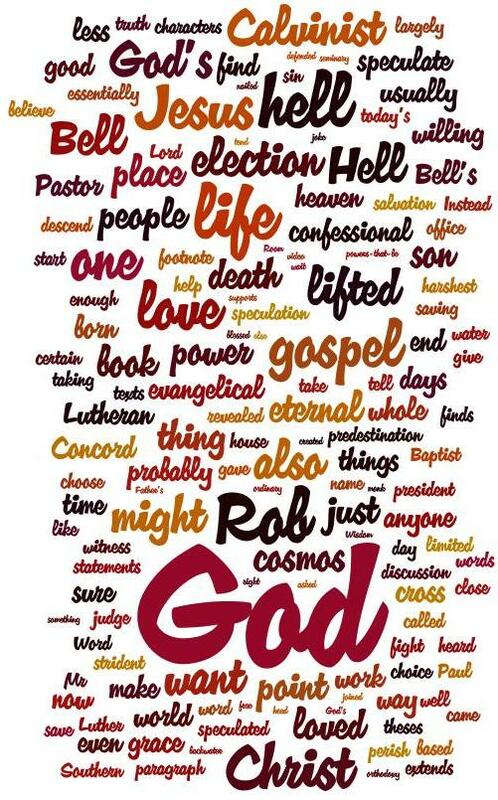 Many would, but I don’t think he’s gone outside of the Nicene Creed. But to be honest, I’m biased. What he’s prodded at in my mind is the Reformation consensus – in something minor to a Lutheran and in something core to a Reformed Christian. He’s said the story of a forever hell doesn’t make sense with the Biblical picture of God. When the culture is cohering, nobody questions the culture’s interpretation key. It is only when things get scary, when the culture is breaking apart, that the interpretation key get looked at. And that just makes things scarier. But we shouldn’t be scared. Because we are in the Father’s hands. Compared to the Reformation itself – these are very minor questions. It is probably unseemly for a minister to express too much pride, but this sermon works. The core meaning of the text is who is this Jesus – he is God’s son, he is the new Israel. The question is what does that mean for us? We could imagine a world where God would send his son on a victory tour of sorts. Ha, Ha – losers, you are all going to hell. Bet that is not the identity of Jesus Christ, God’s Son. The Jesus we know is the new Israel. He fulfills, his is faithful, he is obedient where we were not. He comes meek, and humble and putting his power aside. As the new Israel, he starts the new people of God. He makes us into God’s children. As we struggle in this world, we should be formed by that simple recognition, we are the children of God through Jesus Christ. All the devil is trying to get you to do is forget your identity. But nothing in all creation (and that slanderer is part of creation) nothing can separate me from the love of Christ. This morning we took psalm 51 as our text. We know the famous portions – restore unto me the joy of your salvation – but the last four verses spoke a couple of points to me. 1) The purpose of repentance is restoration to the community of God; it is not just private. 2) The purpose of repentance is not a hang-dog sorrow, but a preparation for joy. Look at the progression in the verses. The Lord refuses the formal sacrifice which leads to a broken spirit. The broken spirit (repentance) leads to God rebuilding the walls of Jerusalem. That is a communal ideal, Jerusalem the city and people of God. Being restored to the city of God leads to being part of the community’s worship; sacrifice is accepted. Personal repentance is necessary, but repentance is not just a personal bath. It is a rejoining to the people of God. The Lord welcomes and restores sinners. Dust I am and to dust I will return, but I have not been cast away from God’s presence. The Lord has promised salvation. He builds the walls and does good to Zion. We are a people held in His palm, in His memory. The restoration first seen in Christ, is then displayed in this collection of remembered and reformed dust. The Lord remembers his dust. This is the sermon delivered at the pastor’s meeting. If you heard the transfiguration sermon below, it is similar, but modified in a couple of ways for the audience. 1. I brought in the text for this coming Sunday hopefully to give the pastors a step or a bridge on this week’s meditation. (They really fit together, but that was something that got cut on transfiguration day as too confusing. The pastor’s have the advantage of holding both in their heads.) 2. The application is mostly reworked. Where the congregation sermon focused on individuals being open to the transfiguring grace of God, to the pastors the charge was both personal and as shepherds of congregations. 3. The personal story was ditched in favor of a tie into a presentation title given by the District President. In one way, audience matters a lot. In another, the gospel is the same today, yesterday and tomorrow. The best parts of these sermons probably could have been boiled down to a couple of paragraphs. But I like hearing my voice. Just kidding, a little. What I do think is that this sermon given to the pastors is probably a better fit of message and audience. I was probably thinking a little too much about this one when I was composing Sunday’s. 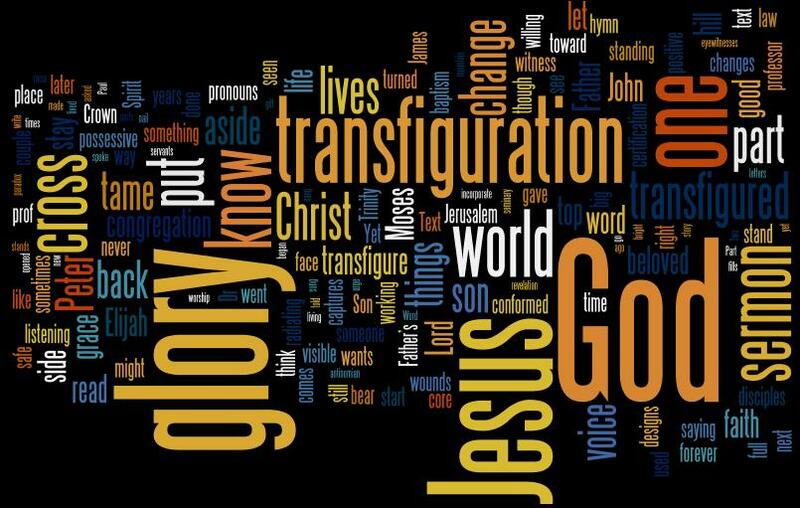 Transfiguration is an evocative word. Being creatures in a half dimension of time, we know the past but can’t do anything about it. We don’t know the future, and usually fear it, especially when we know that it will transfigure us. We can either let that fear change us, or we can let the Spirit transfigure us. What the transfiguration shows us is just how much Jesus was in the same situation. 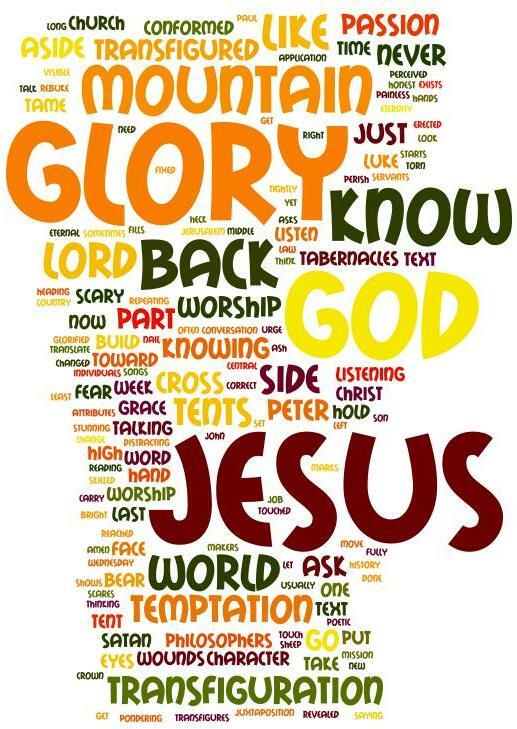 He trusted his Father (our heavenly Father) enough to put aside the glory for the cross. He trusted the character of the Father, the Father he reveals to us. We don’t know the future, we don’t know what Jesus will ask us to transfigure next, but we do know the Character of Jesus. We know what He did for us. Not that transfiguration won’t scare or leave scars, but that is the core of Faith. I trust that one – the crucified one – to change me by his grace.